Rattanakosin came into being when King Rama I ascended the throne in 1782. He decided to establish the new capital on the east bank of the Chao Phraya River for better security from Burma. and hence began the Rattanakosin era or Bangkok period under the glorious reign of the Chakri Kings. King Rama I choose a site between Wat Pho an old 17th century temple and Wat Mahathat, another old Ayutthaya temple. Please see map of Rattanakosin. Book hotels in the old city. With the Chao Phraya on the west and the Lod Canal on the east, the new capital was far more defensible. In accordance with Thai customs, the first task was laying the foundation pillar for the new city. 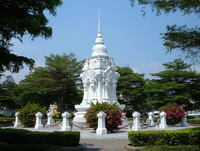 The City Pillar Shrine or Sao Lak Muang was established on 21 April 1782. 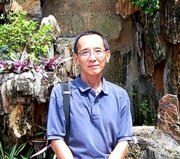 Later King Rama IV, an avid astrologer, felt that a more auspicious location was required. The shrine was moved to the present location on 5 December 1852. Construction of the Grand Palace commenced on 6 May and King Rama I occupied the royal residence on 13 June. Hundreds of boatloads of rubble were shipped from the ruins of Ayutthaya to build the city walls and public buildings in the new capital. At the same time, the Temple of the Emerald Buddha or Wat Phra Kaeo was constructed and completed in 1784. The Emerald Buddha was brought across the river from Wat Arun and installed in the new temple in the same year. Within the walls of the Grand Palace grew a self-contained city that held the seat of government and religion. It was the pride of the Chakri dynasty and Rattanakosin, the city that rose to glory from the ashes of Ayutthaya. Wat Po, south of the Grand Palace, was expanded by King Rama I to become the royal temple and the center of Buddhist teaching. 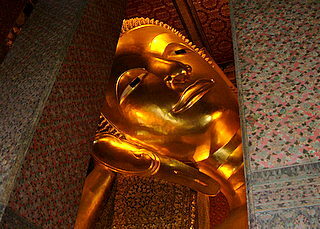 The temple houses the huge gold plated statue of the reclining Buddha. King Rama I appointed his younger brother the Uparat or Prince of the Front Palace, the equivalent of a second or deputy king. Part of the Front Palace is now the National Museum and National Theater. In 1934, the palace grounds south of the National Museum were taken over by the government to start Thammasat University, one of the leading universities in Thailand. The remaining Front Palace wall lines the southern edge of the university along Phra Chan Road. 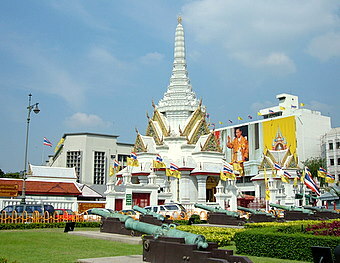 Wat Mahathat, across Phra Chan Road from Thammasat, is another old temple since the pre-Rattanakosin era. The statue at the entrance to the temple is in honor of the Uparat or Prince of the Front Palace, who played a pivotal role in establishing the new capital. 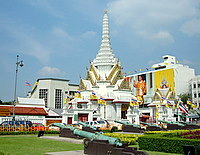 The Mahachulalongkorn Buddhist University is located in Wat Mahathat. The Silapakorn University of Fine Arts and the Fine Arts Department were built on the site of three former palaces in the First Reign. The Royal Field or Sanam Luang north-east of the Grand Palace, is where royal cremations were held in the past. Today it's a location for local fairs and festivities. An important annual event that takes place here is the Royal Ploughing Ceremony in May to mark the start of the agricultural year. At the northern edge of Sanam Luang, near the National Gallery stands the Monument to the Expeditionary Force dedicated to the Thai soldiers killed in the France during World War I. 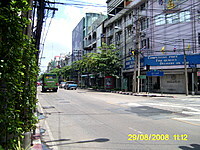 The first canal, Lod Canal, was dug during the reign of King Taksin. In 1785, the second canal ring called Rob Krung (literally around the city) turned the city into an island and so gave rise to the name Rattanakosin Island. Forts were built along the Chao Phraya River and the Rob Krung Canal; a wall was also built along the second canal. The third canal ring around Rattanakosin, Padung Krung Kasem Canal, was added in 1851-54. For more on the defense of Rattanakosin, please see Bangkok forts. Opposite the Temple of the Emerald Buddha, the Ministry of Defence has old Portuguese cannon displayed on the front lawn. This building was built in 1882, during the reign of King Rama V, on the grounds of three old palaces from the reign of King Rama I. The Saranarom Palace, opposite the Grand Palace, was built in 1866 during the reign of King IV. It was later a royal residence for visiting royalties and also the Ministry of Foreign Affairs in 1886. In 1960, the palace grounds was converted to a beautiful botanic garden and public park, Saranrom Park. From Saranrom Park, we see the start of the oldest road in Bangkok, Charoen Krung Road built in 1861 during the reign of King Rama IV. It's a pity that modern buildings have replaced some of the old palaces.The old walls and forts protecting the city have been demolished; only two forts and part of the old city walls remain. 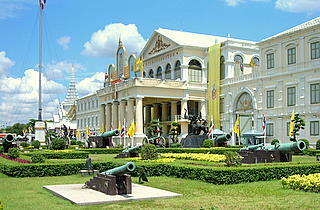 But the remaining structures in Rattanakosin Island give a glimpse of old Bangkok and recapture the glory of that era. The northern half of the map covers Sanam Luang, National Gallery and the Monument to the Expeditionary Force. The National Theatre and National Museum occupy some of the buildings of the former Front Palace during the reign of King Rama I. Part of the palace grounds is now Thammasat University. Wat Mahathat and the Buddhist University are further to the south. The Silpakorn University of Fine Arts and the Silapa Bhirasri Memorial Museum are located at the south-western edge of Sanam Luang. The City Pillar Shrine (Sao Lak Muang), the foundation of the old city, is across the road at the south-eastern corner of Sanam Luang. The Ministry of Defence with its ring of cannon is just south of the City Pillar Shrine. 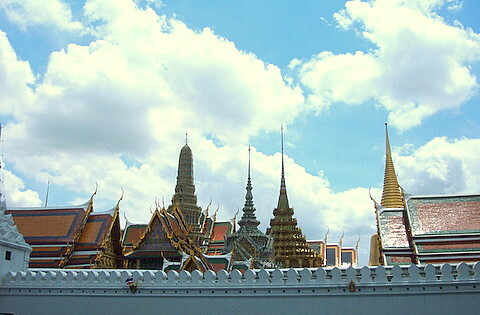 The Grand Palace and the Temple of the Emerald Buddha are to the south and are the main attractions of Rattanakosin. Wat Po the temple with the huge reclining Buddha is to the south of the Grand Palace. Other historical places on this side of the Sanam Luang are Saranrom Park and the King Rama VI Musuem. 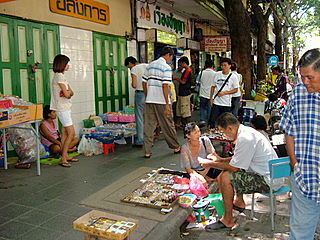 Chareon Krung Road, the oldest road in Bangkok, starts from where the museum is located and stretches 8.5 km southwards to Dao Khanong. A convenient way to get there is by Chao Phraya river boat to one of the river piers in the area, at N8 Tien Pier or N9 Chang Pier. If you are going to the Grand Palace and the attractions to the north, use N9 Chang Pier. 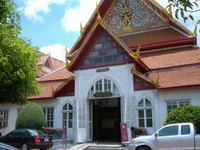 If you are going to Wat Pho, the King Rama VI Museum and Saranrom Park, use N8 Tien Pier.